We have been tinkering with the CRM Leads manageent for months. 3. Use UBER style to create competition within the sales team. a. If you are fast, you get more leads, more success. b. if you are slow, management will see, less action, less meeting, less success. 3. Only yourself to blame if you are slow. Look at this new feature in OfficeCentral. New Entrepreneur - Why we need CRM for our business? I was also asked by new entrepreneurs why they need CRM for their business? They are too busy building up business, do not want to waste time on CRM tools. 1. When you start your business you will be very busy. 2. CRM is a sales tool. 3. You need to be efficient, fast, not wasting time. 4. You need a strong prospect and client database. 5. You need powerful and efficient system. 6. You should get your product detail, prices within seconds. 7. You should get your prospect detail, prices within seconds. 8. You should get your account detail, prices within seconds. 9. You should get your inventory detail, prices within seconds. 10. You should be able to provide quotation within seconds. 11. You should be able to provide invoice within seconds. 12. You should be able to provide receipt within seconds. 13. You should provide quotation, invoice, receipt while travelling, using your phone. 14. You should have your meetings on the go. Update what is discussed immediately. 15. You should be able to get the whole history of your account and customers within seconds. Basically CRM will help you to become more successful. The start up phase is crucial for your survival. If you are totally inefficient and making too many mistakes, too many delays, you will fail. No CRM, business will fail prematurely. CRM is a must, not a luxury. New entrepreneur - Why we need accounting for our business? I always thought that every entrepreneur understand that they need accounting to manage their company well. However I received many questions from new entrepreneurs on the same thing. Why do I need accounting when I start my business? My answer is always YES you need accounting. Being an entrepreneur you need to know what is going on. 4. How much is the gross profit? 10. What is your cash flow? Without Accounting, you will not be able o answer that questions. they know what is going on in detailed. Not "Rasa nya bisnis kita untung, tapi tak tau mana duitnya, aahhh pening betul"
OfficeCentral is in the business category like Salesforce.com. Software as a service category. 1. The company focus on user acquisition. 2. The company spend almost all their available cash on customer acquisition. 3. Profit is not the target during growth stage. The company is loss making every year in the review. 4. The company value goes up with the user growth. Value = user growth. Company value is not calculated from company profit. 5. Investor value user growth over company profit during growth stage. 1. They must operate within their available cash. 2. They must careful in balancing growth and profit. 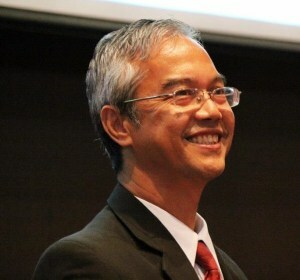 Malaysian Investor will look at profitability. 3. Can they get growth and yet achieve profit? 4. Will Malaysian investor invest when they see the company is not making profit? Balancing growth and profit will result in slower growth. 1. They will focus on early adopters. This is easy. Focus on technology. Superior technology will get early adopters to come in. Normally the high tech companies are very good in doing this. 2. However the next stage is to get the EARLY MAJORITY to come in. They will only become customer when they believe the company are already the leader in the niche, the product is the leader, thousands are already using the product, the company already strong, low risk decision. 3. The company need investment in Branding. Branding - cost money. However if no brand, cannot get the early majority customers. So if the company do not spend on branding, the growth will be slowed down. 4. The company need aggressive sales team. Building demand. This requires money. 5. The company requires strong marketing team. This need money. 6. With the need to keep profit, the activities will be small scale. The impact will be small. 8. 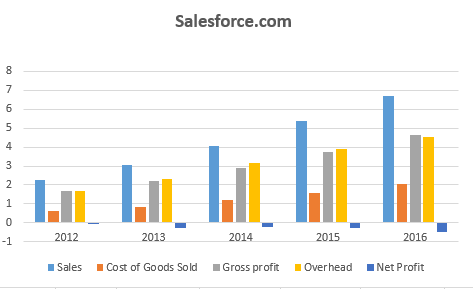 Can we achieve valuation like Salesforce.com? ( Valuation is USD50 billion) even with loss of USD460 million. 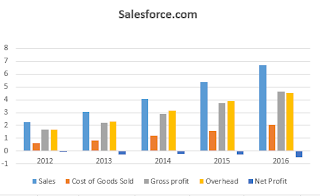 Can we build a company worth like Salesforce.com? Can we build global customers like Salesforce.com? The management must be able to handle this situation well. Hardworking, Creativity, Global vision, Global operation will be the base strategy. Zahir Accounting is the leading accounting software in Indonesia. Zahir Accounting is considered to be the best and innovative small business accounting software in Indonesia. All financial reports are automatic, completed with interactive analysis and chart for business decision making. Easy to use and help you to manage your business easily and very nice graphical report. However Zahir Accounting is based on the older PC-based technology. It lacks the power and features of the latest cloud and mobile technology. OfficeCentral is the leading cloud based enterprise management software in Malaysia. OfficeCentral maximizes the use of the power of cloud and mobile technology to provide advanced accounting solutions. All the features that are required by enterprises are provided and some additional fantastic features available in much more expensive enterprise software. The following are the comparison between Zahir and OfficeCentral. Both software have their own group of customers. However it is expected that customers will demand more features that are provided by cloud technology in the future. My staff asked me how to increase leads quality. 2. Leads can come from your Digital marketing and other traditional methods on getting leads. 3. 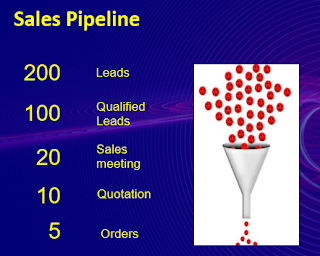 You must qualify your leads otherwise your sales will not be good. 4. 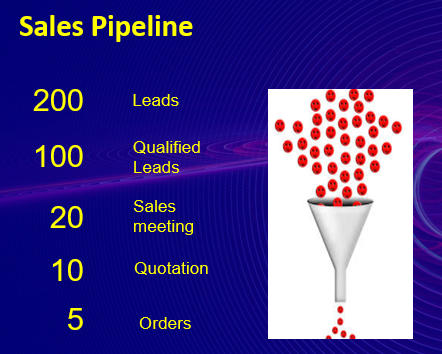 If your leads quality is 20%, then your sales will be 2 successful sales for every 10 customer meetings. 5. You are missing a lot of opportunities because you cannot see all the leads. Many leads you will ignore because you do not have time for it. 6. You are having a panadol. If you meet people with the headache, then chances are you will be able to sell the panadol. If you meet people that have no headache, then you will not sell the panadol. 7. How to do that? 8. Build your questionnaire to enable you to filter the leads. 9. What are the questions? You can organise your meeting and schedule it much better with this information. 1. If your prospect is having certain problem to solve, then he will be happy to share it with you. See whether your panadol can solve his headache. 2. If your prospect is not having any interest to know about your product, then he do not have the headache. He do not need your panadol. Don't waste your time. He will call you when his headache is getting worse. Send him your product information. 3.If your customer is serious to buy the solution, he will be interesed to come and see your office. He wants to make sure that he is dealing with a reputable company, a leading product and a good support team. Invite them to come to your office. By filtering your leads, you can increase your sales success. Imaging that your success is 40%. This means every 10 sales meeting, you are getting 4 orders. You double your sales with the same number of sales meeting.